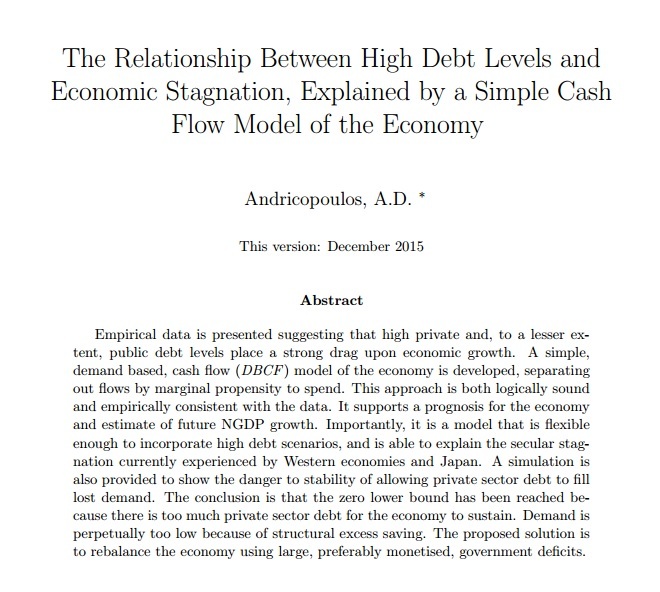 Notes on the Next Bust: Is Economic Growth Fake if it is Fuelled by Exponentially Increasing Debt? Is Economic Growth Fake if it is Fuelled by Exponentially Increasing Debt? The question in the title relates to the period leading up to the crash of 2008 where economic growth in the UK and US coincided with rises on house prices, rising levels of private sector debt and a general financial sector boom. The idea of this post is to ask whether this growth was real and sustainable or whether it was based on borrowing growth from the future and that we are suffering the inevitable comedown now. This post is part a response to my own previous thoughts on this subject (as well as others whom I have seen propounding the same view) and in part a continuation of my previous call to look at money in a different way. In the current paradigm, my previous thinking was correct but if we can change our mentality it need not be. Economists often draw a straight line through trend economic growth, which goes through 2008 and continues upwards as if there had been no crash. They point out the gap between where we are now and where we would be now - often arguing that austerity has caused the gap. But that's unfair, I used to say, because the growth in the period leading up to 2008 was debt fuelled growth and now we are deleveraging so we are paying some of that growth back. The idea behind this was that by using debt we were in some way borrowing from future growth. From one point of view, this was completely correct. In this post, I discuss my empirical study that shows how private sector debt causes a stimulative increase in GDP in the year that it is borrowed. This amounts to around 11% of the amount of debt taken out - so if private sector debt rises by 10% of GDP then we could expect a 1.1% increase in GDP that year. But this growth is not cost free. The increase in debt creates changes in structure of the economy so that money flows to people with a lower propensity to spend, as I discuss here. Higher levels of debt correspond to lower GDP growth (all else being equal) as it causes a structural reduction in demand. In fact for just that 10% of GDP of private sector debt, the demand in future is lowered so much that the GDP growth of a country with that extra debt is lowered by 0.15% per year for every year. The only way around this was to lower interest rates and encourage even more debt to replace the missing demand. In that sense, every increase in private sector debt bought trend growth in that year, but caused a loss in future years. So it was borrowing from the future. 1) Fiscal policy; using government borrowing and repayment of debt to put money in or take it out of the economy. 2) Interest rate policy; either by setting the short term rate or also, as more recently because demand has become so low, using Quantitative Easing to reduce the long term rate. This then encourages/discourages private sector borrowing which increases the money supply to the economy. Unfortunately, partly because of the very high level of debt and partly because of the increased ability of the corporate sector to extract rents (maybe through technology, patents, offshoring etc. ), this has led to what we have now, which is a structural deficit in demand. If, for every £1 spent in the UK economy, 1p gets saved and only 99p is spent next time around then the result is a shrinking economy and unemployment. I have built a flows model which shows in a simplified way how this happens. The only way for the government to stop this shrinking economy is to increase demand in one of the two ways above and put the 1p of spending back into the economy. By creating approximately 10p of mortgage debt to put that 1p back, the government is making the demand next year lower and the problem larger. 3) Central Bank Cash. The Central Bank is able to regulate demand by printing new money which it gives to the government for public spending or tax cuts. The Central Bank can also demand a return of money from the government to reduce the money supply; leading to tax rises or spending cuts. No interest is charged on this money. The reason that it is vital is that we need to break out of the debt spiral we are in. There is no other obvious way out, short of large default, revolution or other major event. Unless we wish to wait it out - but it could be a very long wait. In my flows model, I show why this is no more dangerous than using interest rates to control the economy. This is also discussed here. One sometimes sees frankly idiotic comparisons to Zimbabwe. It is a bit like saying that you should never eat meat because if you ate a whole cow you would burst and die. A credible Central Bank removes any risk from this. The only way to get an economy similar to Zimbabwe's is to put in place a policy that takes away most of the productive capacity of your economy, while at the same time needing money to fight a war abroad. Then, if you are printing money to pay the soldiers and government employees and there is nothing to buy in the shops - guess what? You get inflation. But this is a symptom of a collapsed economy, not a cause. We need to stop thinking about money as a stock - a fixed quantity. We need to start thinking about money as a flow that keeps the economy at full capacity. Yes, money as a stock is a store of value. But as I argue here, we can not simply protect this value regardless of the costs. The store of value can only be as a share of the future economic activity - not a fixed amount when that amount is unpayable. I argue here that it is an economic crime to run the economy at lower than full capacity. It is clearly better for everyone if everyone has a suitable full time job. This makes the economic product of the country at a maximum. Note that I say a maximum. This brings me back to the initial argument. I would now argue that no, the economic growth leading up to 2008 was not fake. An economy can only grow at the maximum that it is allowed to by certain constraints. These constraints are that you can not have more than full employment, you can not take more from the environment than is allowed by regulation, you can not grow unless you have invested time in developing technology that increases productivity. All of these are not related to money. The economy needs enough money to be flowing through it in order to achieve the full capacity. Too much spending relative to productivity and the result is inflation. There is a maximum to the amount of growth that can be achieved and this is called full capacity. And there is no reason not to be there except mismanagement of money. Too little money, and the result is an economy running under capacity. In the period up to 2008 the growth was very real because the economy was running at capacity and real productivity growth was achieved. The problem with it was that the way that we chose to keep the economy at full capacity was with private sector debt. But it need not have been. It could have been with Central Bank money or government spending. The only problem we have for the future is that the ways of the past are unsustainable as they create structural shortfalls in demand. If we were to start printing Central Bank money now, then we can continue to enjoy an economy running at full capacity and growing at trend growth in the future. The question is what mechanism is used to get the CB money into the economy , and how is it distributed. When the CB bought MBS , that represented a form of helicopter money for the holders of those securities. The trouble was that those people had a low MPC , so the boost to the economy was very weak. The other issue is moral hazard. If all the highly-indebted actors get bailed out by a full employment , high-wage , low interest rate environment facilitated by CB printing , there won't be any debt aversion , and we'll ratchet up the debt/gdp levels to no end. Finally , I think another possibility is that inflation could become uncontrollable in a worst-case scenario. If we print our way out , so will every CB. Global asset values will soar as economies come back to life , and global liquidity will run rampant. Once inflation starts , there may be such a reservoir of money/assets available that any single CB would be impotent in their efforts to rein in inflation. Marko, great to hear from you again. In answer to your first point, the government would need to be given the money to spend in the real economy on investment/tax cuts/stimulus spending. Obviously using the money to buy MBS helps mainly the holders of MBS. On your second point, high interest rates may be necessary to encourage reduction in debt levels. This is counteracted by new CB money. Between the two, it should be possible to keep inflation at target level. Asset prices will be increased by growth, but reduced by the higher interest rates. In a way, we have to reduce debt share of the economy so savers will to some extent have to pay for the reduction in debt. But I would argue that savers have enjoyed primacy for far too long. The most important factor in decision making should be the whole economy rather than protecting savers and punishing debtors. Regarding your third point, I would say that inflation can only become uncontrollable if we allow it to do so. If we dilligently and carefully control the money flow, I think there is less danger than there is now. The increase in private money supply needed to be equivalent to an increase in central bank money (well targeted) is much higher. The risks to the system of huge amounts of debt and private money are higher than the risk of unreasonably high inflation expectations in my opinion. I agree with you for the most part , actually. Of the options we have , I think CB-financed gov't spending and/or tax cuts is the way to go. It has to be done in the right way , however. If it was truly a "free lunch" , everyone would have been doing it for the last several hundred years or so. We have to see those private leverage levels coming down , using whatever means are necessary. Gov't spending and tax cuts should be designed to preferentially impact the most indebted , meaning the bottom 90-95% of individuals AND businesses. These are most likely to be the ones who will respond , driving demand. The wealthy have been doing their thing all along , and the biggest corps will start investing again when they expect the demand to return in a sustained way. My suspicion is that none of this will happen , though. I think we're more likely to see another attempt to juice credit flows into real estate with loose underwriting , etc. , kicking the can down the road , again. BTW , I wish all the guys arguing about austerity and its effects , or lack thereof , would do something like what you're doing. They don't , I suppose , because they've never given much thought to private debt and debt overhang , and thus how it might interact with public debt. I agree with the commenter "Suvy" about non-linearity of the relationship. The current-growth multipliers for debt and their corresponding measures for negative impact on future growth would be different in the 70s , 80s , 90s , and 2000s , as the public and private ( and combined ) debt/gdp levels changed pretty significantly over that time. I wouldn't worry about it though , as you've got the right idea , and the numbers might not have changed enough to sway the policy arguments meaningfully. Looking at your regressions over , say , 10-yr periods might be interesting. The two periods since WWII when combined private and public leverage went haywire were ~ mid-80s and mid-2000s , and those are the times when I'd expect the correlations to become a bit more flakey. It would definitely be interesting to see how these things change. I suspect that in the (perhaps imaginary) good old days when borrowing was done more to increase productive capacity, rather than to leverage existing investments, we might have seen more of a boost at inception and less of a future cost. I need to find the time to do a full job with the historical data. I don't think there's anything imaginary about the good old days in regards to debt efficiency. We got 75-80 cents of gdp per dollar of nonfinancial debt from WWII thru the 70s , which fell to 57 cents in the 90s , and now we're getting around 43 cents. I think that to get a good measure, we need to look at the efficacy of new debt rather than GDP over total debt. I will do it eventually! Gdp/ total debt will give you the same result as new debt/new gdp , as long as you're in a stable debt/gdp regime - which is why I quoted the figures from those particular periods - and as long as you're looking over a long enough time frame ( years ). When you're looking at impulse dynamics over shorter time frames - say , quarterly - the numbers will be more responsive , but again , in a stable debt/gdp regime , the efficiency numbers will also be stable eventually ( by definition ) , and the 2nd derivative will cycle above and below zero. I agree overall , though , that it's more important to look at new debt in trying to make judgments about contemporary policy changes and such. The huge mass of existing debt means that the overall debt/gdp ratio would react very slowly to a new policy that over the long term might cause a big change in the ratio , whether good or bad. The shorter-term metrics would help in deciding whether to continue the new policy , or try something else. There exists another growth constraint, maybe the most important one: the availability of useable energy (in physical terms - exergy). "You can not take more from the environment than is allowed by regulation" doesn't address this fact. Economists (Steve Keen being an exception) don't bother with such constraints, most of them are trapped inside their abstract models. Marco, I 100% agree with you. We need to have growth that is sustainable in every sense and the environment is the most important of these. I believe that global laws need to be put in place to protect the environment, with compensation for the countries that have to make the larger sacrifices. I believe that carbon should be taxed globally. I believe that urgent action is of the utmost importance. But I do not wish to complicate the message here. Growth doesn't have to mean destruction of the environment. It could mean provision of more services or improving technology that helps the environment. I am really trying to say that having people involuntarily unemployed, or working in insecure work, or working in jobs they are overqualified for is a real waste of human potential. This is the aim of the blog. Other people with expertise in environmental subjects can discuss how to improve the sustainability in the global sense.